It’s Sunday, the day of the week that I post a blog. It’s also Father’s Day. How could I not combine the two. I lost my Dad five years and 15 days ago. I lost my Mom on April 11 of this year. For the past two months I have been dealing with breaking down a house that holds many memories – I house that I helped build from the foundation up. You see, I worked in construction and then furniture making with my Dad. For the last 20 years of his life, we worked together in one way or another. That’s just another way to say that I have many, many memories. My Dad was more than a Father. We were friends. We traveled the roads selling furniture at shows from Chicago to Connecticut and from Cincinnati to Virginia. We had many hours driving, talking and laughing. One of my funniest memories of Dad was while driving in the New York city area when I car cut us off causing me to swerve the truck and trailer full of our furniture. As things settled down and we moved beside the reckless driver, my 70-something-year-old Dad purposefully extended his middle finger at the other car. We laughed for miles. I’m a lot like Dad when I’m on the road. When Dad decided to build his first house, he picked up a book on how to do the wiring and went about the work. It took him a few inspections, but his job passed. Our family lived in that house for a few years before he built another home. He did the same when he began woodworking. Books were read, tools were bought and a new hobby was started. (My brother and I argued about who would get his first piece – a cherry lowboy – when my parents were gone. 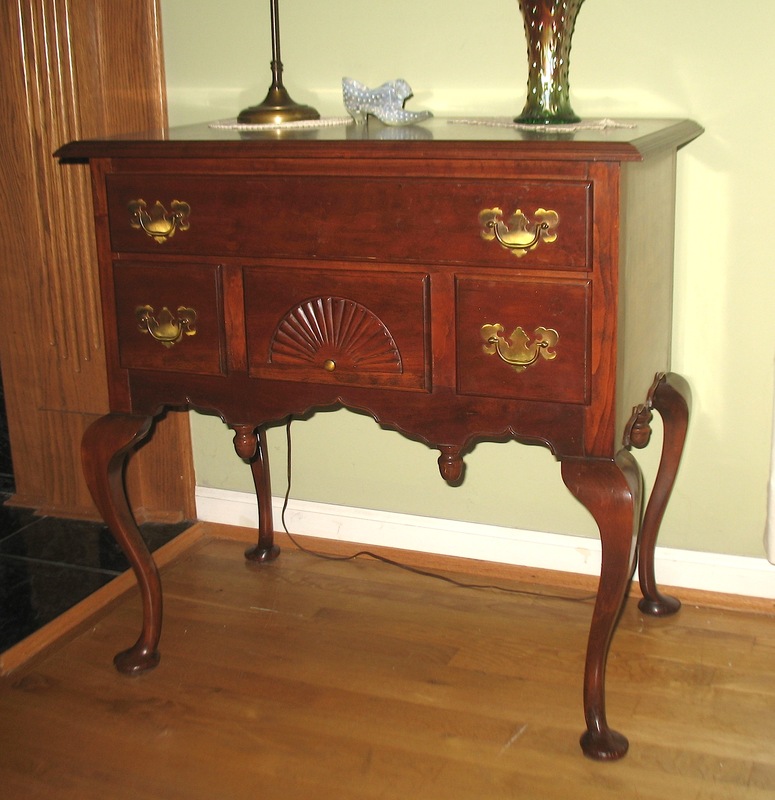 The photo above is that lowboy – and it sits in my house.) Dad could do almost anything. When I talk to woodworking groups on my first visit, I tell them a story about my Dad and how important it is to get your kids or grandkids involved in this hobby, or any hobby. The story goes like this: One thing that Dad couldn’t do really well was correctly pronounce words that he read. For example, when water was first sold in bottles, one of the first to market was Perrier. Dad would call it Pierre. (This is a bit more difficult when writing versus speaking.) He pronounced taco, as in Taco Bell, with a long, drawn-out a. He was only off a bit, but it was a noticeable bit. As a 13 year old shadowing my Dad’s every move, I also began woodworking. I liked what he liked. I did what he did. I pronounced words as he had told them to me. (That was a mistake.) We went to Washington Court House Ohio to a lumber mill – Willis Lumber, if you know the area – to buy lumber for a lowboy and a Shearton Field Bed that I wanted to turn. (I had already turned a dozen bowls at the lathe – obviously I had mastered turning so I moved on to a bigger challenge, and Dad was happy to indulge my fantasy.) After you picked your material at Willis Lumber, you went upstairs and asked to have your selections measured so you could pay. Dad went upstairs and I stayed behind to make sure everything we picked was measured. As the guy measured our lumber, he asked what we planned to build with all the 12/4 cherry and 12/4 mahogany. I pumped out my chest and said that I was building a bed with the mahogany and that Dad was making caribou legs for his lowboy. (Dad told me they were caribou legs – as I said, big mistake!) A huge grin washed over the lumber guy’s face. It wasn’t until later that we found out that these legs were called cabriole, not caribou. I can only imagine how many laughs we brought to the lumber dealer employees. What I don’t have to imagine is how much fun and how many laughs this episode brought to Dad and me. We talked of it often. 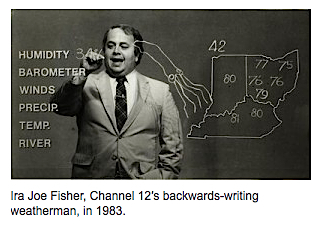 Years later we had a weatherman in Cincinnati named Ira Joe Fisher who, in the winter months, loved to give the temperature in Caribou, Maine. Each morning while drinking a cup of coffee before heading out to work, Mr. Fisher reported the thermometer readings for Caribou, Maine, and Dad and I would smile at each other. We had something between us that few others knew about. Woodworking gave us a connection that to this day makes my eyes well up when I think of it. This is why it’s important to get your family involved in your hobby. You never know when lifelong memories are made. And if this is too much information for you, imagine my middle finger being extended. As I said, I’m a lot like my Dad. If they are still alive, appreciate every moment you can with them… when they’re gone, they are gone… and all you have is Memories… Make them as good as you can. Just a great blog. Thanks for writing this. My dad and I were never close. I do miss him and wish he were around. You have some great memories. What wonderful and special memories of your father. Thank you for sharing them with all of us.